Kids' Book Review: Hello Audio! The 'Audiobooks' that I remember from my childhood were picture books accompanied by chunky cassette tapes, which included a chime sound to notify you when you needed to turn the page. I was an avid independent reader, but I still loved those book and tape sets. I guess no matter how many books I raced through myself, I never grew out of enjoying being read to, and now as an adult I have rediscovered this joy. Skip a good twenty something years into the future and the Audiobooks of 2016 have so, so much more to offer. Technology has seen us jump from those chunky cassette tapes to slimline CDs, and then further still to invisible digital files, but as I have recently witnessed in my job as a librarian, Audiobooks are still an unknown and untapped treasure trove for many, many people. If you pop down to your local library, you are likely to find the book and CD sets similar to my childhood experience (page turning chime and all) all hanging on a rack waiting to be borrowed, but you may be amazed to also discover just how wide a range of Audiobooks on CD there are. These Audiobooks are not accompanied by a physical copy of the book, but are purely CDs of a voice actor reading you a story, sometime accompanied by music or sound effects depending on the intended audience. 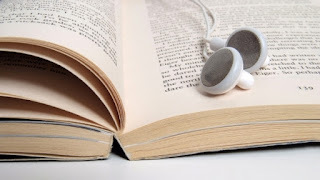 These Audiobooks include titles from all genres and reading levels - picture books, chapter books, junior fiction and young adult fiction, and non-fiction titles for all those levels as well. Alongside the Audiobooks on CD however, there are now Apps that you can download and, for the price of a library membership (i.e. Free! ), you can download Audiobooks straight onto your device (look into Borrowbox and Overdrive, or enquire with your local library for what apps they use). There are also a number of paid apps (such as Audible and iTunes) that you can purchase and download from. Going on a long trip? Load up your phone and stream those babies straight through your Bluetooth. Finished listening to a book before you get home? No matter! As long as you have internet connection and download limit, you can borrow another book on the spot. So long as I have a good Audiobook to listen to, I have found that my long commute to work has become something to look forward to, and in fact I have often plugged my headphones in to continue listening to my Audiobooks while I cook dinner, hang washing, vacuum or exercise. I have borrowed many of Julia Donaldson's titles on Audiobook, such as The Gruffalo and Room on the Broom to listen to in the car with my preschoolers (it has never been so calm and quiet, and now the second they get in the car they both ask me to "please listen to a story? "), I've avidly listened to the entire Harry Potter series on Audiobook (and highly recommend them for anyone wanting something the whole family can listen to) and borrowing Audiobooks has given me the chance to read (or re-read!) books that I would otherwise not have time to sit down and read. Getting your kids into Audiobooks can have numerous benefits. They offer a great alternative to screen time entertainment (pull out some craft supplies or a puzzle and listen to a story), they can be listened to while doing chores (if your kid is old enough to sort or fold laundry, vacuum or wash up - plug in those earphones and away they go! ), they can offer family time entertainment (particularly in the car) and they can enable struggling or reluctant readers an alternative way to engage with books and stories. Here at Kids Book Review we will be adding Audiobooks to our regular reviewing schedule to make your selection experience easy and enjoyable, so make sure you keep an ear out!